Update your fragrance wardrobe with these fresh, uplifting spring scents. 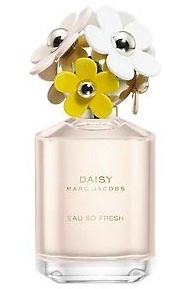 They say don’t judge a book by its cover – but this bottle from Marc Jacobs has totally won us over. The fragrance itself has top notes of strawberry, pink grapefruit and apple blossom all sat atop a base of rose and jasmine for a fruity-floral combo. If you are after something fun and feminine, this perfume is for you. Flirty Alice is just as mischievous as it sounds, with a floral rose bud heart on top of a blonde wood and vanilla base. With top notes of bergamot and green tea, Flirty Alice makes for a feisty and feminine addition to your fragrance wardrobe. A sensual yet light scent, Boss Orange for women is the perfect transitional scent. Combining fruity notes of orange blossom, apple and plum with heady notes of vanilla, sandalwood and jasmine, this fragrance is perfect for those wanting something with a little more body. An oldie but a goodie, DKNY Golden Delicious has become a staple spring scent for many. Crisp and clean smelling, it’s perfect for more casual and carefree days. With many of DKNY’s fragrances aimed at a younger market, Golden Delicious holds its own as one of the more elegant scents.